I am the GIZZARD King, I can FRY anything! The deep fried gizzards and livers were on the table before we ordered our entrees, boasting a crunchy, salty exterior given way to dark, chewy muscle that seemed to squeak when bitten. Liver, although tender and buttery, is exponentially more metallic, abrasive then it's gizzard counterpart. I hated liver when I was boy, disgusted when I would pop one mistakenly into my mouth when thinking it was a gizzard; though these days I crave both, albeit for entirely different reasons. Just a few days after my hometown visit, some friends introduced me to a new restaurant in Kansas City called Black Dirt, an earthy, elevated eatery boasting a special Fried Gizzard special that was nothing short of extraordinary; delicate, soft, and creamy like liver, sans the harsh copper smack in the face. After inquiring, the chef reported back that the gizzards had been brined in buttermilk for nearly a week, breaking down the muscle into a wobbly, tender meat. Someone inquired, "what the hell is a gizzard anyway?" I quickly responded that it was the gall bladder; which may be only partially correct. It's reported to be the muscle tissue in certain animals like duck, chicken, and even crustaceans near the upper part of the digestive tract, just above the stomach, that helps to grind the food to smaller bits and pieces. I suspect the gall bladder of any animal would be dense, tough - but considering the hard feed and pebbles chickens consume, their variety is as rough and tough as any other. Still, it's a delicacy in many parts of the world, including Africa and different parts of central America - and most definitely, and importantly, near my hometown. Following my excursions to Frontenac and Kansas City, I was inspired to create my fried gizzard recipe, borrowing technique, recipes from these two seemingly opposing restaurants. I started by ordering fresh gizzards from our neighborhood butcher, Richard's Meat Market; they were clean, pink, and surprisingly plump. After washing thoroughly, I soaked them in buttermilk for five days, changing the milk every other day to ensure freshness. If you're impatient, you can also braise the gizzards in chicken stock and mira poix for about an hour and half; then rinse and chill before frying. I prefer the buttermilk technique, but the braised variety is quick, delicious. From this point I simply prepared them the way I would fried chicken; dipping each rinsed and dried muscle into seasoned (salt, pepper, paprika) flour, then egg and milk mixture, then back into the flour before dropping slowly into 375 degree oil in cast iron. Fry until golden brown, around 5 to 7 minutes. Crunchy exterior, tender interior texture with umami flavor profile yielding culinary nirvana - this cheap, throw away organ meat, when given a little extra time and care, is transformed into something quite extraordinary. They were particularly delicious the next day as a chilled High South Po' Boy when stratified between day old French bread, coarse grain mustard, and fresh green onions, next to an ice cold can of Ozark American Pale Ale. 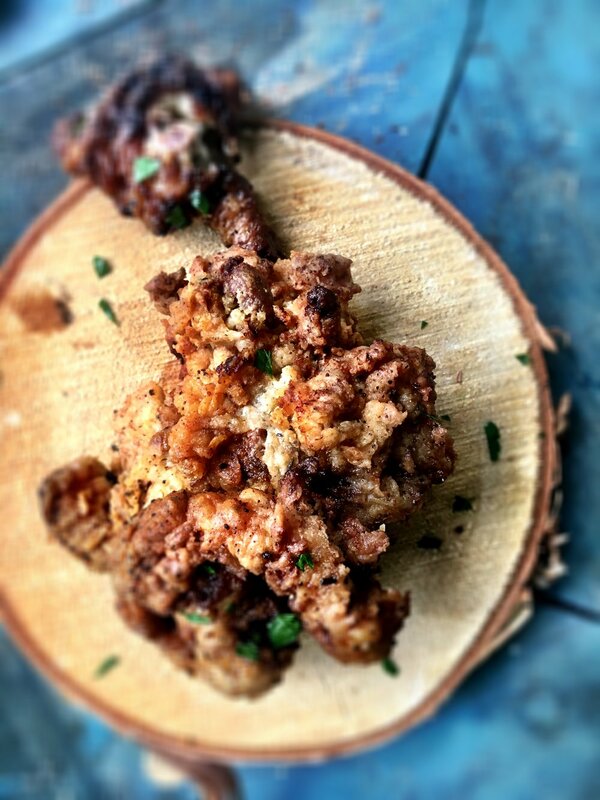 I'm amazed that so many people have such an aversion to fried chicken gizzards, and frankly, that more chefs and gourmets aren't using them in their cooking or on their menus. So, like most things, we'll continue our routines, day to day practices of doing what gives us solace and joy - prosecuting one VILATOR, and frying one beautiful CHICKEN GALL BLADDER at a time - thump thump!